Photos by Liz Martiniak © Liz Martiniak 2003; all rights reserved. 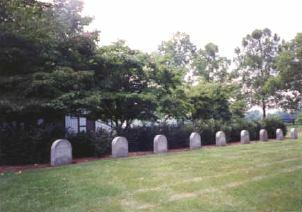 The horses buried here were owned by GREENTREE FARM, forever associated with Helen Hay (Mrs. Payne) Whitney. Daughter of President Abraham Lincoln's secretary - and later Ambassador to Great Britain and Secretary of State -- John Hay, the young socialite poetess married Payne Whitney in 1902. Whitney's father, financier W.C. Whitney, and Payne Whitney's brother, Harry, had established and cemented the Whitney name as prominent breeders and owners in the racing world, and Payne Whitney's nephew, Cornelilus Vanderbilt Whitney continued the tradition. In 1912 the great American trainer James Rowe presented Helen Hay Whitney with a broodmare, Kildeer, with a filly foal at side by Broomstick; this filly, Broom Flower was a good stakes winner and later ancestress of stakes winners. Whitney's first flat runner, in 1914, was an imported horse, Gainer; from then on, Whitney became a breeder and owner of race horses, and was particularly noted as an owner and breeder of steeplechasers. Greentree stables came into being in 1914; at first the broodmares were located at Greentree Farm at Red Bank, New Jersey. In 1925, the Whitneys purchased property near Lexington, Kentucky, and named it Greentree Farm, as well. Although Harry Payne Whitney died soon after its establishment, under his wife's ownership Greentree Farm in Kentucky became a thoroughbred nursery from which such horses as Twenty Grand, First Minstrel, Singing Wood, Kentucky Derby winner Shut Out, and other good runners emerged. Greentree's stallions included Royal Minstrel, The Axe II, Shut Out, Bimelech, The Porter, and St. Germans. Not long before her death in 1944, Whitney's racing interests were merged with those of her son, John Hay Whitney, and her daughter Joan (Mrs. Charles Shipman) Payson. Horses buried here include Capote, Questionnaire, Shut Out, *St. Germans, The Axe II, The Porter, Tom Fool, and Twenty Grand. The great runner Bimelech (Preakness, Belmont Stakes), who spent most of his stud career at Idle Hour Stock Farm, was purchased by Greentree after the death of his owner, and lived here until his death in 1929. At the age of 21, the great broodmare La Troienne was purchased by Greentree after the death of her owner, Colonel Bradley; for them she produced Belle of Troy, dam of the good handicapper and sire Cohoes, and then an indifferent son, Trojan War, her last foal. She was retired to Greentree's pastures where she received the tribute of visitors, until her death at the age of 28. Mrs. Whitney's beloved steeplechasers located here include one of her first, the good steeplechase mare Cherry Malotte, and the outstanding chasers Easter Hero and Jolly Roger. Cherry Malotte's high-class foal, one of the best horses of the early 1920s and a one-time holder of the American record for a mile, Cherry Pie, is also buried here. In 1989 the parcel was incorporated into GAINESWAY Farm. -- P.E.